If you’re looking for the perfect end-of-summer treat, then you’ve come to the right place. 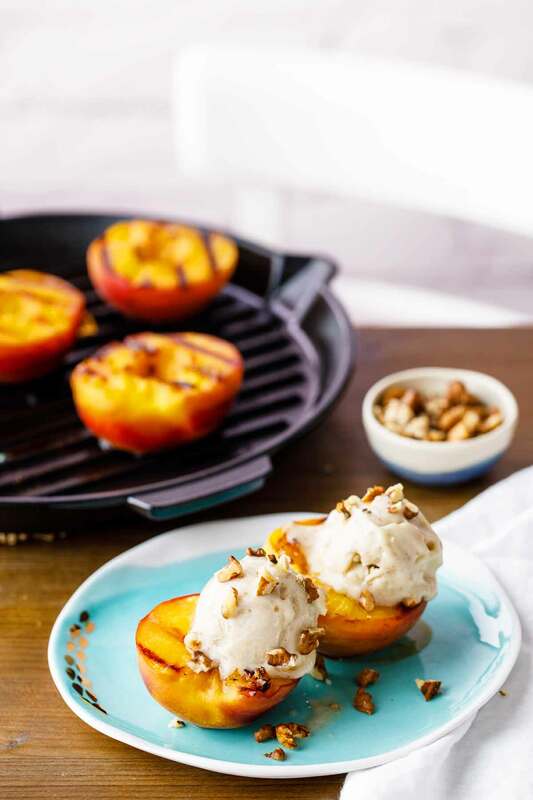 This grilled peaches with banana ice cream recipe makes for the perfect combination of sweet and tangy. The grilled peaches are perfectly warm and sweet while the pureed banana lends a creaminess that is unmatched in flavor and texture. 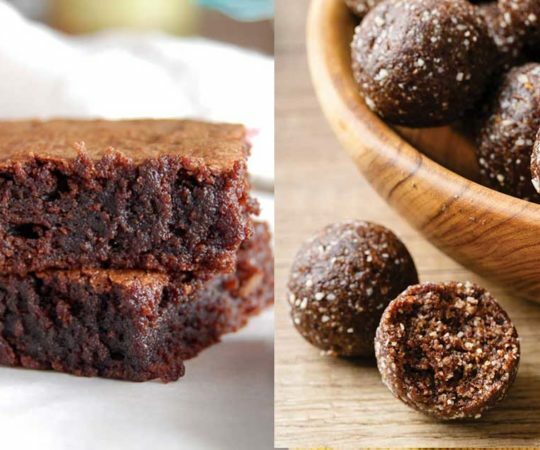 The best part about this dessert is that it’s completely dairy and refined sugar free, meaning it’s one tasty treat that you’ll never have to feel guilty about enjoying. Ice cream is the downfall of many individuals but we don’t blame them. After all, there are few desserts more enjoyable than a big bowl of ice cream. 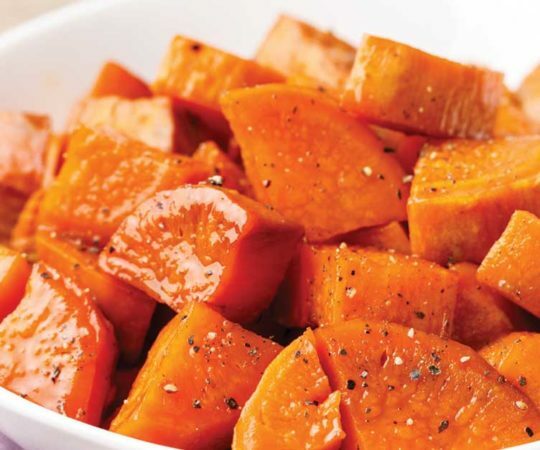 It can definitely weaken even the most disciplined of dieters, so no judgement here. In fact, studies show that ice cream may have similar effects on the brain as certain recreational drugs. (1) Luckily, we’ve created a deliciously simple recipe that’s going to make giving up regular ice cream that much easier to do. Whereas regular ice cream has a long list of ingredients such as eggs, full cream, sugar, vanilla, whole milk, sweeteners and flavorings, our banana ice cream recipe only contains 3 ingredients: bananas, coconut milk, and vanilla. It’s still entirely possible to enjoy ice cream in a paleo-friendly manner with homemade banana ice cream. The riper the banana, the sweeter your ”ice cream’ will be. 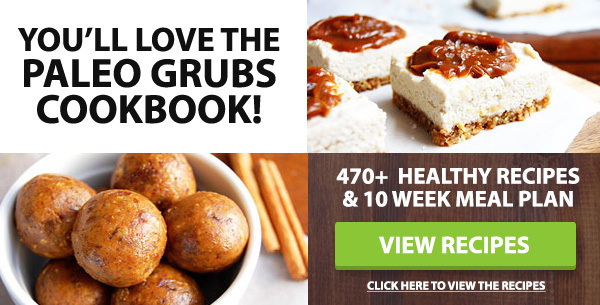 It’s the perfect alternative to regular ice cream, particularly for anybody who is lactose intolerant or can’t include dairy products in their diet for any other reason. Also, the finished product will have only a slight hint of vanilla, so it won’t overpower the other flavors in your dish. Most banana ice cream recipes will require the use of an electronic mixer or food processor. 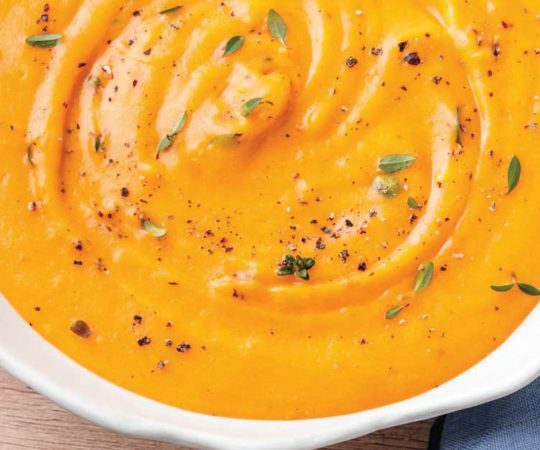 However, you could also use a hand blender especially if you’re just making 1-2 servings. A hand blender is commonly used for soups and sauces, but it can also be used to blend your frozen bananas into ‘ice cream’. 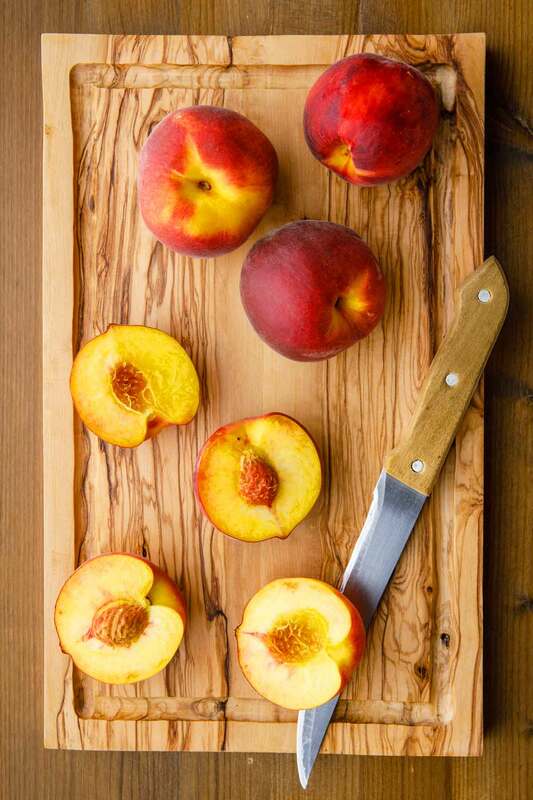 Peaches are an incredibly sweet and nutritious snack all on their own. However, once you throw them on the grill, you really take them to the next level. 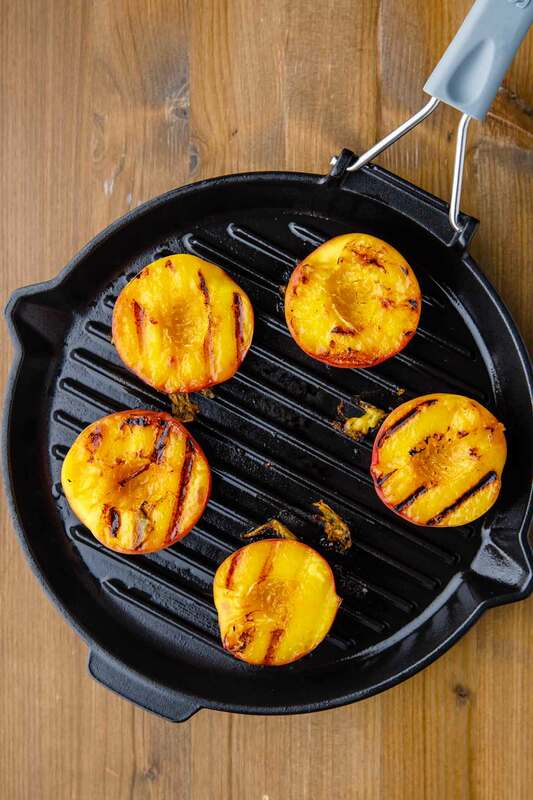 By cooking peaches on the grill, you add a smoky flavor while caramelizing their natural sugars. It’s amazing how a couple of seconds on the grill can make an already tasty treat into a mouthwatering delicacy. 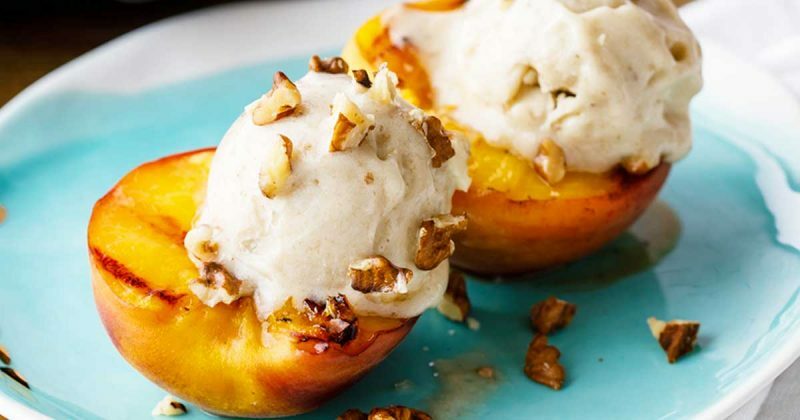 Peaches and cream is a classic dessert offering for a very good reason. 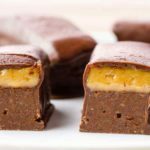 This recipe adds a delicious and healthy paleo-friendly twist to that dessert staple with the addition of the homemade banana ice cream. Add a sprinkling of chopped candied walnuts on top for some added crunch and to add a bit of texture to your dessert. 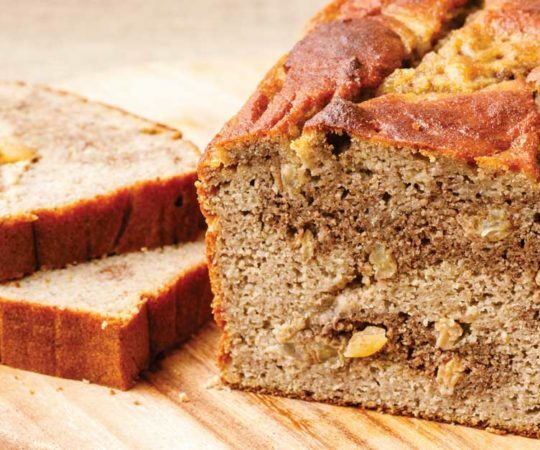 As you can see, there are all kinds of great ways that you can use bananas to make many tasty meal options that are normally off-limits for paleo enthusiasts, such as pudding and pancakes. Brush peaches with 1 tablespoon of coconut oil. Heat a grill pan over high heat. 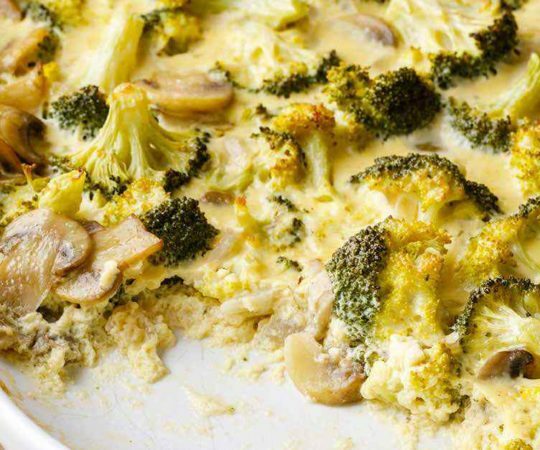 Oil the pan with ½ tablespoon of coconut oil. Place the peaches on the grill pan and grill 4-5 minutes per side. In a food processor, combine frozen bananas, coconut milk, and vanilla extract and blend until smooth and creamy. 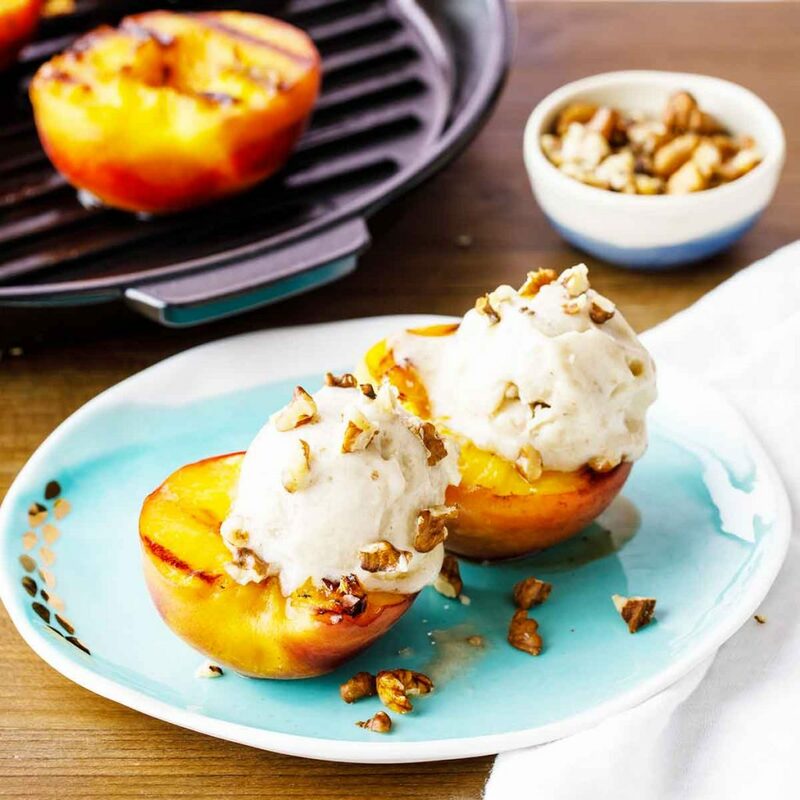 Serve grilled peaches with banana ice cream sprinkled with chopped walnuts.